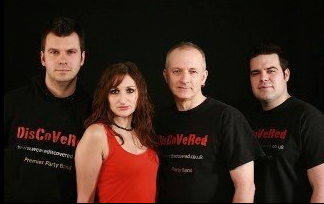 DisCovered are a Premier Party Band playing covers of Classic songs and Anthems from the 60’s to the present day including hits from artists such as Rolling Stones, Beatles, Abba, Stevie Wonder, Tina Turner, Michael Jackson, Oasis, Take That, Killers, Kaiser Chiefs and many more. Credited as James Corden’s favourite covers band, all band members are degree-qualified professionals from Tech-Music Schools (London) and have got a wealth of experience performing all around the UK as well as the EC and Asia. Over the last 5 years we have performed at weddings and functions in some of the most historic venues around the UK including The Ashmoleum, Waddesdon Manor, and HMS Warrior. Some of our previous clients include NHS Trusts, BMW Rover and the Royal Air Force.